One of the beneficiaries of Grassroots Foundation in 2008 was the Paraguayan Movimiento Agrario y Popular (MAP), a movement of small farmers and landless families that has its basis in the region Caaguazu, Central Paraguay. MAP's has played a very active role in the Frente Social y Popular (FSP), a coalition of rural and urban movements founded in the run up to the elections of April 2008. This resulted in a change of government to a more progressive one, for the first time in Paraguay's history. The months August to December were crucial, as the new Lugo government entered into power, promising integral land reform, and the new (GM) soy planting season started as well, involving fumigations that severely affect food crops, people's health and the environment. The MAP organized a long series of events varying from local manifestations in Vaqueria and Mariscal Lopez to participation of more people in the national mobilization in Asuncion; from mobilisations to support local campesino leaders who got legal complaints filed against them to a seed saving event. And in between, many meetings, workshops and radio broadcasts to organize and inform community bases of the MAP. Also, work expanded with new MAP local groups being started in other regions such as Misiones. 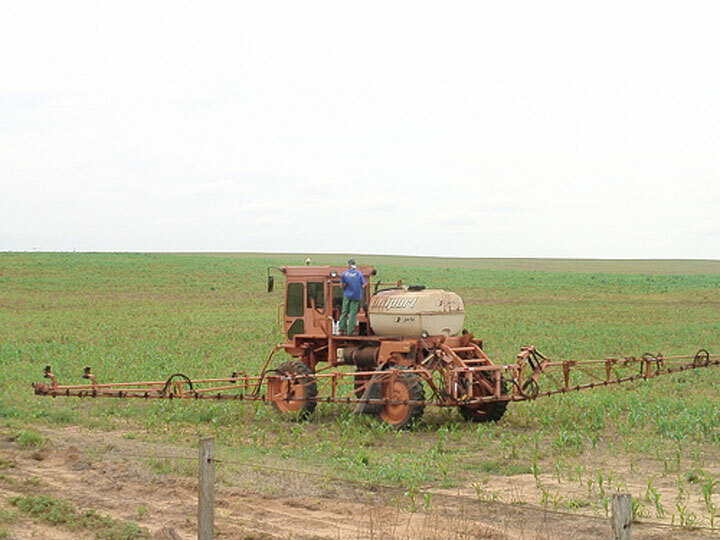 The MAP was the first organization in Paraguay that won a historical court case against the illegal sale of public land to soy farmers by the Paraguayan Land Reform Institution (INDERT). Until recently, this institution was highly corrupt. 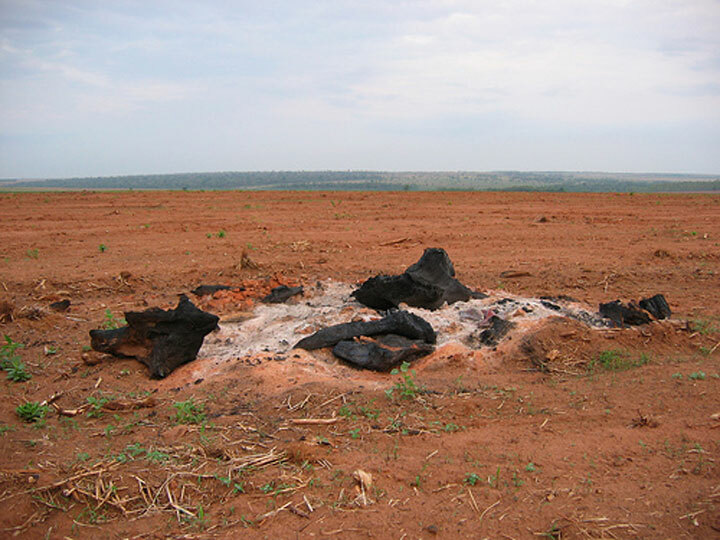 These lands are now being reclaimed by campesino and "sin tierras" movements around Paraguay. In order for real change to happen, for the rural population to achieve justice, integral land reform, and access to education and health service, and to get rid of soy and other monocultures from their communities, is still a long way to go. The new Lugo government has brought some changes, but also some deep disappointments. Power shifts are needed at local level, in the national parliament, and in the justice system; but this takes time. The 1,200 MW Ilisu dam project is planned on the Tigris river in Southeast Turkey. It is a region mainly populated by ethnic Kurds and human rights violations and restrictions to freedom of expression by the Turkish state are common here. Ilisu is Turkey's largest dam project and will create a 313 km2 reservoir. Some 78,000 people will be displaced and the ancient town of Hasankeyf will be submerged as well as hundreds of unexplored archaeological sites. Hasankeyf is a national monument protected by Turkish laws which prohibit any infrastructure activities. In Turkey, two court cases are questioning the legality of the project on the grounds that the protected status of Hasankeyf has never been lifted. Another case has been filed with the European Court of Human Rights. International law experts also warn that the lack of consultation with neighboring countries (Syria, Iraq) is a breach of international water law. Nonetheless, in March 2007, Export Credit Agencies from Austria, Germany and Switzerland approved guarantees worth half a billion Euro for the project. The ECAs tied 150 conditions to their approval which Turkey has, however, not made legally binding. 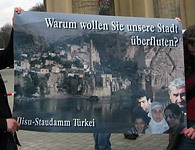 On August 15th, 2007 a bank consortium of Société Générale, Bank Austria Creditanstalt (affiliate of UniCredit Group) and Germany's DekaBank signed contracts with the Turkish authorities to provide loans for the dam. Over the past year, grassroots has awarded two grants to the "Stop Ilisu Campaign". The monitoring reports by the "Stop Ilisu Campaign" have created immense pressure on the export credit agencies as the it is becoming increasingly clear that the Turkish authorities are ignoring the conditions under which the ECAs awarded their guarantees. Grassroots has also helped support court cases against the project as well as public campaigning work in Germany and Austria. 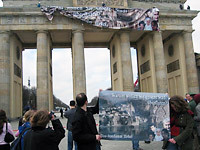 In March 2007, German and Kurdish activists hung a banner with a picture of Hasankeyf over the Brandenburg Gate in Berlin. In October, Austrian and Kurdish activists held protest actions in front of the Bank Austria Art Forum under the slogan "Supporting Art - Drowning Culture". In November, the NGO WEED organized protest actions against the DekaBank in 10 German cities. Officially, there is no commercial cultivation of genetically modified plants. Although Bulgarian laws governing genetic engineering actually exceed EU regulations in some aspects, on the whole they have not been adjusted to EU levels since joining the EU. Bulgaria's previous administration had decided to make no changes unless forced by the EU, and a change of government in 2009 also led to a change in policy with regard to genetic engineering. This was probably due to massive pressure by the industry and the American government; reportedly one topic of discussion during a meeting between the prime minister and James Warlick, the American ambassador to Bulgaria, was the strict Bulgarian laws that practically prohibit cultivation of GMOs. Even if the basic tenor of Bulgarian law (dating from before EU times) conforms to EU release and labeling regulations, some specifications markedly exceed protective limitations set by the EU. Hence release and marketing of genetically modified plants such as tobacco, grapes, wheat, vegetables or fruits are strictly prohibited (in contrast to the EU where case-by-case decisions would be within the realm of the possible). Additionally 30-k-protective zones, where cultivation of GMO plants is totally prohibited, have been drawn up around all ecologically sensitive areas that are listed in a national nature reserve registry. In addition ecologically run farms enjoy special protection as no cultivation of genetically engineered plants nearby is allowed. More than any others, these three points proved to be a thorn in the flesh of the gentech lobby. The new government which took office in July 2009, had been pursuing a double strategy: it ruled for a five-year-moratorium on cultivation, but simultaneously introduced a far more liberal law governing genetic engineering, which would have allowed large-scale cultivation after five years. The Agrolink group (supported by us), Za Zemiata and other NGOs protested against this compromise of simultaneously liberalizing the law, while at the same time announcing a multi-year-moratorium. Several appearances of the Canadian farmer and recipient of the Alternative Nobel Prize, Percy Schmeiser in October 2009 (made possible by grassroots' financing) became an important impetus towards instigating an extensive civil rights movement, the size of which had never been seen in the more recent history of Bulgaria, as well as a widely acclaimed film portraying this internationally famous critic of the Monsanto company which was shown on channel 1 of the Bulgarian National TV company. Bulgarian civil society was enormously mobilized by this conflict surrounding the amendment to the genetic engineering law. 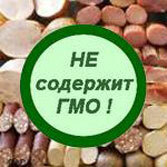 18.000 citizens signed a petition demanding "Bulgaria Free of GMO". During the first three months of 2010 twenty-seven groups merged into an anti-GMO-coalition, with a total of 550.000 members on Facebook alone. In addition to the capital Sofia, sixteen further demonstrations were organized in seven other cities. Thousands of postcards with children's drawings were sent to the prime minister and the European parliament. An opinion poll showed that 97% of the population want Bulgaria to be GMO-free. All the media repeatedly reported on the protests, which came to a successful conclusion in March 2010. Faced with massive civil rights protests, the government and a large majority of the Bulgarian parliament (144 yes votes, 1 nay vote, and three abstentions) were forced to vote the exact opposite of their original plan. Instead of watering down the strict genetic engineering law, the government not only had to rescind their proposals for modification, but also were actually forced to tighten the law. They maintained those regulations that had exceeded EU regulations. No cultivation of GMOs in nature reserves and Natura-2000-areas as well as in a 30 kilometer buffer area. Use of public discussion forums and educational measures in order to convince other farmers and landowners to keep their fields free from genetically engineered plants. No cultivation of GMOs within a 10 kilometer radius of stationary bee hives. No cultivation of GMOs within a seven kilometer radius around ecologically run farms. As soon as another EU member state imposes a national ban on an EU-approved genetically modified plant, the precautionary principle takes effect, and Bulgaria automatically falls in line with the ban (right now this applies to MON 810, prohibited in several EU countries, but also for another genetically modified plant that has been approved within the EU, the Amflora potato, prohibited in Austria since April 2010; a ban that has automatically taken effect in Bulgaria). Anyone found in violation of these rules, may be fined between 250.000 and 500.000 euros. Due to the administration's exposure of various improper dealings in the food sector, parliament had agreed on new labeling regulations the day before the vote. Between 2004 and 2009, state food safety agencies had discovered that one third of all samples contained unspecified GMOs; while in 2009 64 per cent of all Bulgarian food manufacturers surveyed were found to have used more unspecified GMOs than permitted by law (in 2005 this figure stood at a "mere" 30 per cent of manufacturers). Both test results were kept secret for a long time. It was only due to Agrolink's persistent research efforts that these results are on public record. The media have taken up the topic of genetic engineering with great enthusiasm following publication, while simultaneously increasing pressure upon the government. This scandal clearly showed that at this writing the Bulgarian administration is incapable of controlling the market, which led to the passage of a new law tightening labeling regulations. From now on warning labels will have to be placed on products warning of GMO additives, whose lettering must be twice the size of the other inscriptions. - This is yet another exemplary Bulgarian policy which could serve as an example for the other EU-countries. Until 2007, approximately half of the projects sponsored by the grassroots foundation in Central and Eastern Europe have been implemented in Russia and the former Soviet Republics (CIS). In order to better coordinate these divers activities, a strategic workshop, funded by the foundation, was held in Moscow in April of 2004 which culminated in the foundation of a new action and communication network: the “CIS Alliance for Biosafety”. Lobbying for CIS civil society interests at both national and international levels. So far 21 organizations from nine different countries have joined the Alliance: Armenia, Belarus, Georgia, Kazakhstan, Moldova and Transnistria, Russia, Tajikistan and the Ukraine. Most of these groups have conducted projects funded by the grassroots foundation. The Alliance’s activities are essentially geared toward public relations efforts. For this purpose an internet portal has been established which up till now has been the only Russian-language website dealing with genetic engineering (www.biosafety.ru); as of the middle of 2007, an English version has been added. In addition to this website, the Alliance’s Moscow office has been dispatching two Newsletters on a regular basis: one directed to Alliance partners and other NGOs critically disposed toward genetic engineering, and the other one for journalists only. Food production and pharmaceutical companies in violation of human rights – as defined by the Global Exchange Rating. Produce for food production containing GMOs as well as a list of companies that deal in these. An extensive dossier on biotech companies like Syngenta and their activities in Russia. Last year a new section on „GMO-free zones“ was added. Most of the groups sponsored by the grassroots foundation in the past years strive toward making their regions GMO-free by utilizing political lobbying as well as press and public relations efforts for their goals. Activities centered at Moscow, the capital, were of special symbolic value. Several test series yielded the results that approximately a third of all soy-based food items offered for sale in Moscow contain considerable amounts of GMO without any reference being made on the labels. Food producers prefer to pay small fines, rather than implementing the labeling regulations through extensive incoming goods control systems. 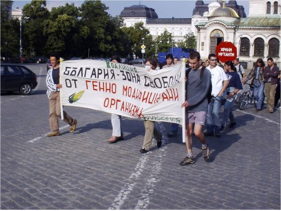 In December of 2005, the Moscow administration yielding to pressure from environmentalists and consumer advocates made preliminary suggestions on how to keep Moscow GMO-free in the future. However, officials never followed up this first initiative; therefore, the second Moscow workshop of the Alliance in April of 2006 drafted an open letter to the mayor of Moscow initiating an Alliance campaign to continue this process. This letter and the ensuing discussions between the Alliance and administration representatives led to several laws having been introduced since the summer of 2006, restricting GMO practices in Moscow. That municipal agricultural holdings refrain from cultivating genetically modified plants, even in (as yet unheard of) cases of responsible state authorities permitting commercial use of GMO organisms. That compliance with existing labeling regulations will be more stringently checked in Moscow than before, while penalties for violation of these regulations will be increased. That all Moscow schools and nursery schools are prohibited from using food products that have been genetically altered. In February of 2007, yet another law was introduced in Moscow regulating possible use of voluntary GMO-free labels. The regulation provides for food producers and wholesalers having their products tested for the absence of GMOs at a certified municipal laboratory, which would bestow a “GMO-free label” in case of positive testing. Food bearing this label has been available in Moscow as of July 1, 2007. So far 30 companies with more than 100 brands among them have received the label, while another 100 companies submitted relevant applications within weeks of this date. If the „GMO-free Moscow“ project continues in this successful vein, other cities and regions of Russia and their contiguous states might follow suit. The Moscow-based groups of the alliance (the Eremurus Club and the International Socio Ecological Union) have played a significant role in the success of the campaign, while assuring that similar activities in the regions and states of other alliance partners will be initiated and implemented.